The Wayne’s World Garth Kit includes Blonde Wig and Glasses as pictured. 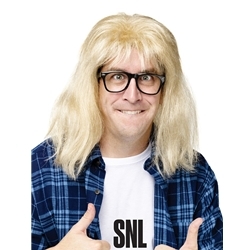 Take on the loveable look of Garth as seen on the Saturday Night Live Sketch Wayne’s World! Pair with a plaid shirt for an easy and fun Halloween costume. Find a buddy to wear the Excellent! Hat with Hair and it will be party time for the two of you! Excellent!